This is the summary of consumer reviews for RIDGID 18-Volt X4 Hyper Lithium-Ion Cordless Drill and Impact Driver Combo Kit with Radio. The BoolPool rating for this product is Excellent, with 4.60 stars, and the price range is $199.00-$219.99. The RIDGID R9601 is a 18-Volt Cordless Drill and Impact Driver Combo Kit that comes with 3 tools and a free Radio. These tools offer best- in-class torque and power for the most demanding applications. Compact drill features a 4-pole open frame motor that delivers 535 in. lbs. of torque. Impact driver delivers an industry leading 1,750 in. lbs. of torque to handle the toughest applications and features a one-handed quick-load bit holder. Both the compact drill and impact driver feature exclusive Grip Light technology which engages the LED light by simply holding the tool and innovative Hex Grip micro-texture for maximum comfort to make every job easier. The compact 18-volt radio offers 3 different modes for AM, FM and Auxiliary Input. All three tools are powered by HYPER Lithium-Ion Technology built for high performance. RIDGID offers lifetime service warranty on tools and batteries too. 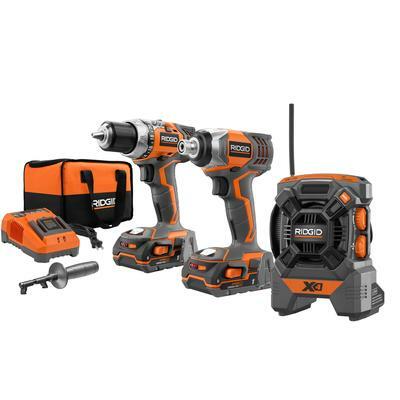 Overall, the RIDGID 18-Volt X4 Hyper Lithium-Ion Cordless Drill and Impact Driver Combo Kit with Radio is a great professional quality tool at competitive price. Buyers really like the lifetime warranty on the tool and batteries. Note: This review is for Models: R9601 and R9600. Rigid's products are reliable, durable, and have a warranty that beats any other company. Just remember to register the product within 90 days.Very satisfied with this product and would highly recommend it. The batteries charge quickly and retain the charge nicely.I'd originally purchased a similar Hitachi kit, but returned that kit after hearing about Ridgid's lifetime hardware & battery warranty, which is hard to beat in this product line. I've used Rigid products for years. Very happy with the product for the price. Professional level products for the home DIY'er. Great products with no complaints so far. They're extremely powerful and love the work lights. Rigid products always work great and are tough. This works quite well for small holes in concrete, tile, and cement blocks. Saved me from having to buy another tool.The light feature is great on both tools and shows the work area very well and is easy to turn back on if it times out. Best yet is the lifetime warranty. I use them at home and at work. Everythings seems to be working well so far. The batteries charge fast at less than 40 minutes. The work lite is great in dark places. Lifetime warrantee on the battery as well? Great tools at competitive price with Lifetime warranty on tools and battery. Great tools with Lifetime Warranty and you can't beat the price. Anyone who's ever owned a battery powered tool knows that when the battery stops working its usually less expensive to buy a replacement tool, rather than a battery. You get a lifetime warranty on the tool and battery after you register your serial number! I bought the tools because of lifetime service agreement. Best investment in home improvement tools for me yet. I'm now looking forward to purchasing other tools that'll accomidate the batteries that came with these tools. With Ridgid's Lifetime warranty, there'll never ever be a reason to replace your tool. I bought these because of the lifetime battery warranty and cost of replacement batteries, not worth it as the Dewalt is a much nicer tool with better battery life. Full battery charge in like 5 minutes. Batteries charged in less than 20 minutes with clear indicators on the progress.LED light is bright and is placed nearby the battery vs. nose part - it lights-up the work area clearly.Will look into more Ridgid products.(hide). I was impressed how quickly the batteries charged, which will keep me working as I can change batteries quickly. They replaced the NiCad batteries with Lithium batteries, Of course the Lithium batteries wouldn't charge in my NiCad charger so I did have to upgrade to a new Lithium Charger for $59.00. The batteries charge quickly and I love the battery indicator on the front. This combo replaces my Craftsman 14.4 volt NlCad drill that the batteries finally wouldn't hold their charge and to replace both batteries wouldn't be cost effective. Plenty of torque and battery run time before recharge. The built-in LED work light and battery level indicator lights are great features on both tools. Surprisingly compact and light weight, with plenty of power and torque. 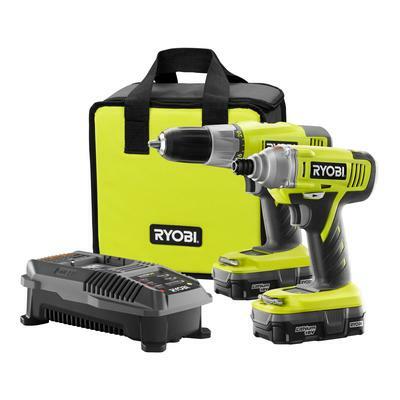 The drill and impact driver have powerful built in lights, both tools are very light weight - balanced, and powerful (yes powerful). Compact size, light weight, bright LED light that's positioned well...overall I'm very happy with it.Registered for the Lifetime Service Agreement this morning and sent the required info off. It also has the nice LED light. Strong and long lasting battery nice radio too. Well packaged set that included: Carrying Case, 110V Battery Charger, 2 Drivers, 2 Batteries, 1 Radio, adapter handle & belt clips. The weight and compact style make it easy to handle and the light is a nice feature. The feel and balance of each is nice and the LED lights work great, also there's a separate trigger switch just for the lights, so you don't have to be drilling just to have the light on and it gives off plenty of light in just the right spot.The batteries charges fast and the charger is a smart charger,it Runs a test to make sure there's not a problem with the battery or the temp of the battery. I like the built-in light and the battery indicator. Can't beat the lifetime warranty. LIFETIME REPLACEMENT BATTERIES AND SERVICE IS A PLUS. How can you beat lifetime warranty? Can't beat it with a lifetime warranty!. I'm especially satisfied with the lifetime warranty on the tools and batteries. Lifetime warranty is well worth a little extra money. Also the lifetime warranty on ALL parts including the batteries. There isn't a lifetime warranty on this product it's a lifetime service agreement. Then I discovered that the batteries have a lifetime warranty which is very important when you've battery powered power tools. I now have 4 batteries to power 6 tools! You can't beat a lifetime warranty on the tools and battery. And who else offers a lifetime service warranty on the tools and the batteries? The battery charger prevents overcharging which shortens battery life.If you've been using cordless tools for many years, you've no doubt found yourself throwing away an otherwise good tool because it made better financial sense to buy a new one than to replace the battery. The drawback was I'd to send my battery, charger and drill as well as another tool, battery and charger. This set is amazing, it changed my veggie on battery power tools completely. The two best things about it're likely both related to the lithium batteries, battery life and power. you can't go wrong with a lifetime warranty on batteries! Make sure you register on line because that lifetime warranty covers the batteries too!